Summary: A story about an overprotective, mid-twenty widow who has the undivided love for her son and books. During one autumn, her life resorted to be best-selling chapters without her knowing that she was being someone’s main character in a book. Summary: (Heat) – When the truth prevails. A story about globetrotters who traveled to Southeast Asia for the first time, but greeted by misery on their second day. Noelle had witnessed an unexpected series of event during her first exploration through the urban city, which ultimately reveals the most hideous mystery beyond her like-minded beliefs. Summary: A story about two stranger’s life instantly intersects after a random first meet – the rich became poor, the successor became a loser and vice versa. They stumbled upon each other again after several months; but on this occurrence, they couldn’t determine whether their metamorphosis lives was destined to be, or was it just a meditational dream. Summary: A story about someone who loses the freedom of choosing the path to her own future, even after 30 years of living. Summary: A short comedy excerpt about a girl who complaints to a stranger on the verge of surviving a rat race’s life; who unexpectedly turned to be her new Manager. Summary: A story about a photographer who was on assignment during a festival in Sabah, only later found himself caught up in a murky incident in one of the sacred rituals. 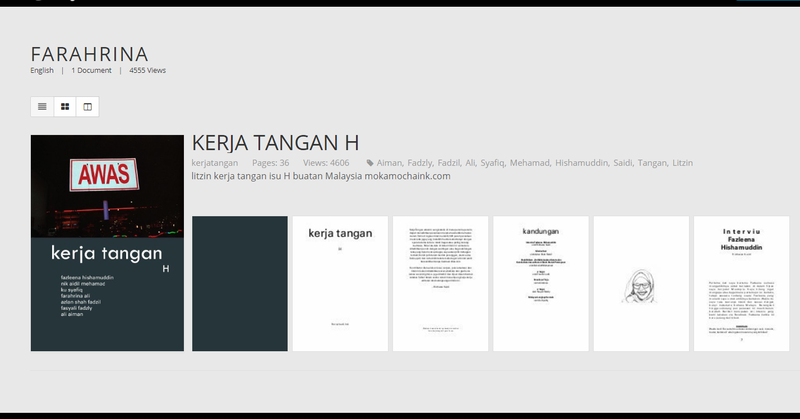 Summary: A collection of poems for Literature Zine. Published for both online and physical version in Issue Number 8.